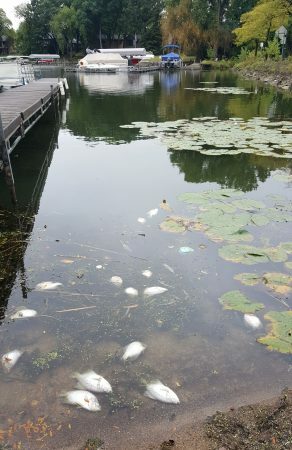 Following reports a couple of weeks ago of crappie die offs on Spring Lake, the District has recently received several reports from residents of a crappie kill on Upper Prior Lake. Based on resident reports, only crappies have been found so far in the fish kills on both lakes. Why are the Crappies Dying? The MN DNR Pathology Lab have taken samples from the crappie kills on Spring Lake and have identified two types of bacteria that were affecting the fish. The bacterial infections identified are most likely a secondary infection to a primary cause. Both of these bacteria occur naturally in the lake water. When fish are healthy, their immune systems defend off these bacterial infections. When fish become stressed from other factors such as low oxygen conditions or other primary infections, the fish can no longer fight off the bacteria present in the water and may become weakened and die. Falavorbacterium columnare which causes Columnaris disease and is more common with fish kills in the spring. This disease is host-specific and does not pose a health risk to residents or dogs, although the DNR recommends not consuming diseased fish. Aeromonas hydrophila is very common in lakes and can affect fish. In rare cases, it could potentially cause illness in humans and pets (especially those with compromised immune systems), most commonly gastrointestinal illness or wound infections. For safety, the DNR recommends that people wear gloves when handling the dead crappies, especially if they have an open wound, and wash their hands if they handle the dead fish. People should try to keep their dogs from eating the fish and contact their veterinarian if they have concerns about their dog’s health. In terms of swimming or using the lake water, the MN Department of Health recommends that residents minimize their risk of getting sick when swimming at beaches and lakes in general by following the guidelines on the following link: Recreational Guidelines. Fish washed up on my shoreline. What can I do with them? The MN DNR recommends that residents leave the dead crappies in the water to decompose naturally, if possible. In addition, many local wildlife and birds are natural scavengers, and this provides a great meal for them. Place the dead fish in a plastic bag and dispose of it in your trash receptacle. Check with your service provider for any restrictions. Safely burn the fish in a backyard fire. Fish must be free of lake debris, weeds, garbage or other waste material. No plastic bags will be accepted with the fish. It is best to bring the fish in 5-gallon buckets or other container that can be taken with you when you leave. The cost is $10 per load/trip regardless of quantity. When arriving at the ORF, stay to the right and stop at the small purple building by the gate for instructions and payment. Drop-off times during business hours only (Monday – Friday from 7am – 5pm, and Saturday from 8am – 4pm). Fish are not eligible for drop-off during Scott County Free Yard Waste Drop Off Program. Help the MN DNR and the University of Minnesota track fish kills! If you observe fish die-offs on Prior Lake or any of the other lakes, you can report any findings on the U of MN’s fish kill reporting map. The fish kill map is a tool that was created to identify fish kills in Minnesota. This map tool allows you to identify the date, location, approximate number of fish and condition of the fish and note if anything about the fish looks abnormal. UMN researchers may then investigate the kill and gather specimen samples for the UMN veterinary diagnostics laboratory. UMN staff also shares the fish kill information with the MN DNR and other agencies that might do their own investigations.